The Old Patriarch stands proudly along the base of the Grand Teton Mountains. 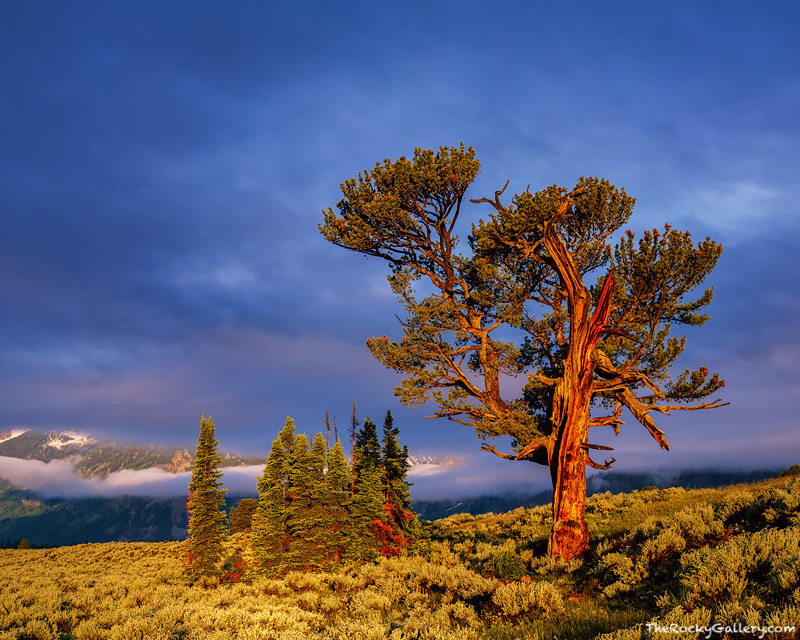 This icon of the Grand Teton National Park is a thousand year old Limber Pine that sits on the flats east of the Teton Range. The original Park road through Grand Teton National Park passed near to this tree and made it a scenic highligh. Today, the tree is more difficult to find as the new park road passes about 1/2 mile west of the old grade. On this morning I hiked out across the flats hoping to shoot the classic Wyoming view of the Cathedral group framing the Old Patriarch. It was clear as I hiked out across the flats and damp sage but as the soon began to rise, fog quickly formed and only allowed for a partial view of the Cathedral group. The Old Patriarch however, was illuminated by the warm morning light as the Sun peaked through the newly formed fog. I often try to photograph under interesting skies. This morning was one of the most unique morning I have spent in the field. The smell of the damp sage brush, this ancient limber pine, and the quikcly forming fog made for a very memorable morning of photography. Photo © copyright by Thomas Mangan.